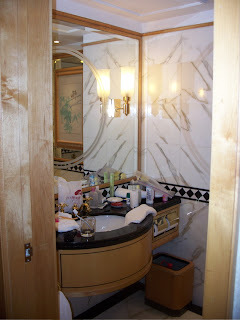 White Swan may be the adoption tradition, but the rooms have certainly seen better days. 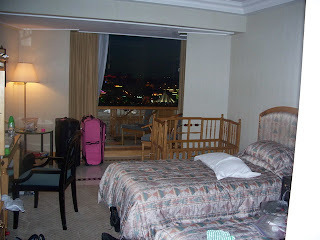 It makes sense to me why they are closing down the hotel to redo all the rooms. Here is Juna's crib. I will be anxious to see what the Westin's "Heavenly Cribs" look like and hope future families post pics when they come to GZ. 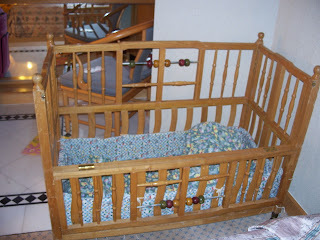 As you can see, this crib wouldn't even be taken in by Goodwill in the States! The room. The best part being the view. Certainly not those horrendous beds. The bathrooms. I bet they will renovate these to look more like the high-end style "W" hotel bathrooms which feature Asian inspired high end luxury. These are very 80s. I do like the sound system! Classical music to go with your intestinal distress? Sure! Another room pic. 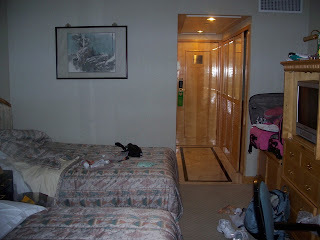 The rooms do not match the luxury of the rest of the hotel. What families will miss is the fantastic light show at the end of the day. As Steve told me today, "The Chinese realize you need to unwind at the end of the day. This is why they have the light show." Unwind I shall before our big travel day in the morning. Goodnight! Happy 9th anniversary! Just a few more hours and you 3 will be home!